Most of us are conditioned to slather on the sunscreen before we dive into outdoor fun. But that doesn’t mean we like it. Sunscreen often makes you feel sticky and smells unpleasant. And what about all those mystery ingredients that make you wonder if it’s even safe to use on yourself or your kids? Holly Thaggard and her physician father-in-law set out to find a better alternative after a young friend was diagnosed with skin cancer. The goal was to create safe and advanced UV products that meet stringent international sun protection standards and are also free of possible carcinogens and endocrine-disrupting ingredients such as parabens. Their toxin-free creation is called Supergoop. Supergoop does double-duty to protect your skin from head to toe, combining sunscreen with moisturizing lotion for your face and body. 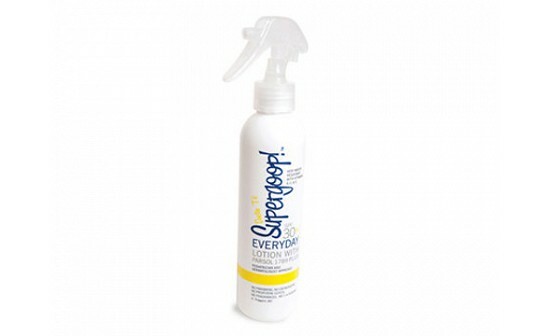 As a sunscreen, Supergoop provides SPF 30 wide-spectrum UV protection. It’s water, sweat, and sand resistant — and it’s blissfully free of fragrances and synthetic dyes. As a moisturizer, Supergoop is gentle enough to be used every day, and it’s oil-free so it doesn’t leave a residue. We’re offering Supergoop in four applications that can cover (literally) you all year long; a 24 oz supersized pump, a portable spray, easy-to-apply sunscreen wipes, and a lip formula that provides sun, wind and saltwater protection. We all know how important it is to shield our skin from the harmful effects of the sun. With Supergoop there are no more excuses — this is daily skin protection you can feel good about. I'm Holly, founder of Doctor T's Supergoop! We are very excited to reach out to you today. Along with our Sun Specialists, I am available to answer all of your UV protection questions so please, ask away! Sun protection products can be very confusing. Currently there is no test method recognized in U.S for Broad-Spectrum, UVA/UVB claims so manufacturers are free to make these claims without being able to back them up. We work closely with our chemists to meet international standards for UVA and UVB and water resistant protection. In addition, we are particularly mindful of keeping the controversial ingredients, possibly carcinogenic and irritating (parabens, propylene glycol, fragrances), out of our lotions, sticks and sprays. We look forward to your feedback and to helping you better understand all sun protection products so that you can make the best choice for your family. How long does this sunscreen last once applied to the skin? Does it remain effective until it is rubbed or washed off? In other words, if I apply it as a moisturizer in the morning, is the sunscreen still effective when I go out in the afternoon? Finally some-one had the sense to manufacture a joint moisturiser-SPF solution! Supergoop! SPF 30+ Everyday UV lotion has clinical testing to back the Very Water Resistant claim which is the highest rating for water resistance permitted by the F.D.A. That said, if you are running day to day errands and you apply in the morning, the protection will only lessen in number as it is exposed to direct sunlight so it will still be effective in afternoon. If you are swimming and at the beach in the morning, we strongly recommend reapplying after 80 minutes. Awhile back Oprah had a show with people who looked decades younger than their actual age. The one who was the most shocking was in her 70's and looked no older than 40's and she said her secret was that she moisturized head to toe every day. (Certainly genetics didn't hurt, either!) I would imagine that Supergoop, with its moisturizing and sunblock, would really be a great way to keep your skin healthy and young! We will be in Maui next month where some pools and springs are requested to be free of sunscreen items. Are your products considered OK for natural areas? Thanks! @Becky - great question! We've forwarded it on to Holly for her insight. @Becky - Holly has responded that it is a tough question because they have experienced a different set of standards for different coral reef destinations. They have several dive shops who tell them that their Everyday UV lotion is one of the only they allow in the water on excursions. Most of the time, it is the natural ingredients with Titanium and Zinc that they prohibit. She also pointed out, and I couldn't agree more, that she would not for a minute consider opting to go free of sunscreen! She would apply a generous coating before arriving at the pool/dive site. Because Supergoop! does not leave a residue or film on the skin as it is completely absorbed into the epidermis, it would be undetectable and highly unlikely (given the water resistance rating) that it would contaminate the waters. I am currently looking for a safer sunscreen for my children and myself and there just doesn't seem to be one. 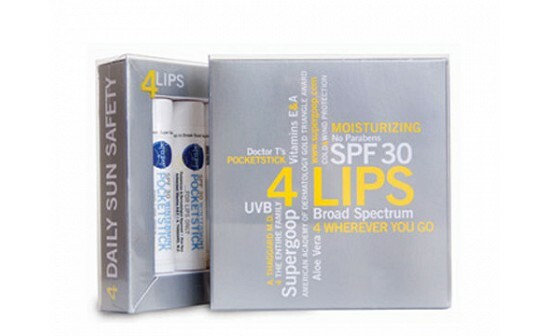 Does this product provide UVA and UVB protection? Is nano-technology used in the production? Is vitamin A in the ingredient list? I can't seem to find an ingredient list, is one available? @letha - this is what Supergoop! says about Vitamin A: While conclusions from the FDA will not be expected until October, 2010 regarding the Vitamin A concern, Supergoop! no longer manufactures any of our products with Vitamin A. They take their commitment to providing a safe sunscreen for the family very seriously. They work with HEALTHY CHILD HEALTHY WORLD to achieve this and are proud to say that all their ingredients are TOXIN-FREE, including possible carcinogens such as oxybenzone and paraben endocrine disruptors. They are also FREE OF SULFATES, PHTHALATES, SYNTHETIC DYES, FRAGRANCES, PROPLYENE GLYCOL, NANO-PARTICLES, AND PADIMATE 0. How many wipes does it take to cover an average adult and an average child, age 4-6 years? @Kimberly: I have been in contact with Holly and for an average adult she suggests 4-5. One for the head and chest, one for the arms and one for each leg. She admits, though, that when it comes to sun protection she will err on the side of too much! A child would need 2-3. 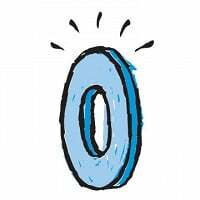 Does Supergoop have Oxybenzone or Retinol as ingredients? @Bill: No Oxybenzone, no Retinol. Can I wear Supergoop without ruining my clothes? Due to medical issues and medications, I need sun protection if I'm to be out more than a few minutes. Regular sunblocks have ruined a good many of my clothes and are not practical to wear with dresses/slacks, etc. Can I use Supergoop and still wear my "nice" clothes? @Redcurlyhead: I will find out what Holly says and let you know. It would be great if this was the solution for you. @Redcurlyhead: We have not had any complaints regarding any of our formulations changing the color of clothing. The textures are very lightweight and absorb very nicely into the skin rather than physical blocks that sit on top of the skin and often rub off. Most of us are conditioned to slather on the sunscreen before we dive into outdoor fun. But that doesn’t mean we like it. Sunscreen often makes you feel sticky and smells unpleasant. And what about all those mystery ingredients that make you wonder if it’s even safe to use on yourself or your kids? Holly Thaggard and her physician father-in-law set out to find a better alternative after a young friend was diagnosed with skin cancer. The goal was to create safe and advanced UV products that meet stringent international sun protection standards and are also free of possible carcinogens and endocrine-disrupting ingredients such as parabens. Their toxin-free creation is called Supergoop. Supergoop does double-duty to protect your skin from head to toe, combining sunscreen with moisturizing lotion for your face and body. 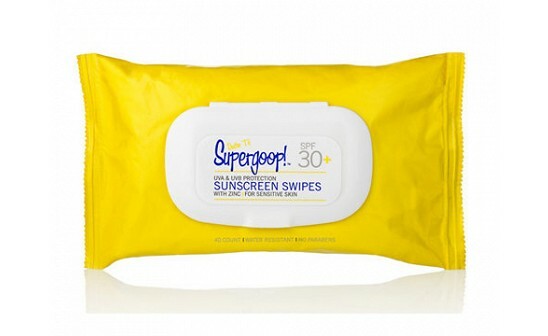 As a sunscreen, Supergoop provides SPF 30 wide-spectrum UV protection. It’s water, sweat, and sand resistant — and it’s blissfully free of fragrances and synthetic dyes. As a moisturizer, Supergoop is gentle enough to be used every day, and it’s oil-free so it doesn’t leave a residue.